Overjoyed Chinese cheered and applauded in front of their TVs at home, beneath big screens in bustling city squares or in remote villages on Friday night, sharing the passion and glory of the long-anticipated Olympic Games as they opened in Beijing. The glittering opening ceremony inside the new National Stadium, or Bird’s Nest, in the capital, was witnessed by more than 100,000 in the stands and by billions in China and around the world as it was live broadcast. Many people interviewed by Xinhua said they felt honored and proud that their country was finally able to host the biggest sports event in the world. Thousands of local residents gathered beneath a giant screen at Shangxiajiu Square in Guangzhou, in southern China, to watch the opening ceremony. Many wore T-shirts saying “I Love China” and “Go, China” and many of their faces were painted with Olympic symbols. At one dormitory in Guangzhou, more than 100 laborers from rural areas gathered to watch the event on TV. “Usually I don’t watch sports too much on TV, but I couldn’t miss it this time. Our country is getting stronger every day. I think all of us should be proud,” said 22-year-old Zhou Xiaobing. 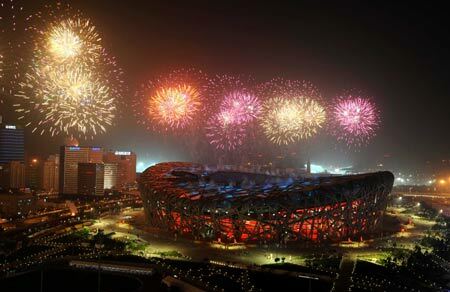 Watching fireworks over the splendid Bird’s Nest was a particularly moving moment for construction worker Ma Yonghong, for he was once among thousands of builders of the landmark stadium in northern Beijing. Ma held a small party on Friday night, inviting several of his fellow workers to beer. “There are so much to celebrate tonight, for Olympics and also for ourselves,” said Ma at a construction site in Xi’an, northwest China’s Shaanxi Province, his current workplace. “We spent two years working in Bird’s Nest. Till now, I can still remember the sizes of wash basins and faucets I had installed inside the stadium,” Ma said jokingly. China spent billions of dollars to build state-of-art stadia, sports facilities and infrastructure for the Olympics in Beijing and six co-host cities, fulfilling its commitments made seven years ago when Beijing won the right to host the Games. Jacques Rogge, president of the International Olympic Committee, on Friday night offered warm thanks to the Beijing Olympics organizers for its tireless work. Seven-year-long anticipation and imagination came to an end when the Chinese President Hu Jintao announced the opening of the 29th Olympic Games, which draws over 16,000 athletes from 204 countries and regions. Su Shaoyun, who lives at a small town Baofeng in northwest China’s Ningxia Hui Autonomous Region, said she was thrilled by the opening ceremony masterminded by famous Chinese film director Zhang Yimou. “All those audio and video technologies in the performance made me feel like in the space age,” said Su. An editorial in Friday’s English-language newspaper China Daily said the opening of the Beijing Olympics was a Chinese dream come true. “The dream lasted 100 years, unfulfilled, until tonight,” it said, adding that the 16-day Games should help the outside world better understand the host country. “It is impossible to miss the historic coincidence of the Games happening on the 30th anniversary of reform and opening, which has permanently transformed China,” it said. This opinion was echoed by Yan Hongchang, resident of Xiaogang Village in east China’s Anhui Province. A spontaneous move by 18 peasants in the village 30 years ago triggered a reform that eventually changed China’s countryside. But for proud father Huang Zhengyu, the feeling was a bit more personal. At his home in Taizhou, Zhejiang Province, Huang waited anxiously for the Chinese delegation’s procession because his son, Huang Haiqiang, is among the 639-strong Chinese team. His 20-year-old son will take part in the high jump during the Games. “It is the greatest honor for an athlete to participate in the Olympic Games. I am so proud of my son,” Huang said. The father said he was worried about an injury to his son’s foot, which the young man said had healed. “I hope he can score a medal for China,” Huang said. In Urumqi, capital of northwest China’s Xinjiang Uygur Autonomous Region, Memet Ismail’s family began preparing supper an hour earlier than usual so they could watch the ceremony uninterrupted. “I’m very happy to see so many friends from all over the world come to our country! The Olympics are a seed that grows friendship and peace,” he said, while watching the performance with his wife and daughter. “As a Chinese, I feel very proud,” he said. Many foreigners living in China also joined in the joy. “This is no doubt the best opening ceremony I’ve ever seen,unquestionably. The production is amazing,”said Fredrick A. Hutchison, a 69-year-old U.S. native who lives in Xining, capital of northwest China’s Qinghai Province. Hutchison, a veteran sports journalist who had covered the 1968 Olympics in Mexico City and the 1972 Munich Olympics, said the performance at the opening ceremony was “absolutely” full of the Chinese characteristics. “I think any person watching TV anywhere in the world will have a sense of Chinese history and the power that China now has made from its long history. It’s wonderful,” he said. Raul Estrada, a Spanish native who works as general manager of a shoe company in Nanchang, east China’s Jiangxi Province, also considered the whole ceremony was a success. “I like the beginning part most. It’s so impressive and touching, I can feel power and beauty harmoniously connected,” said Estrada. Hooleys Bar, near the North Tianhe Road, Guangzhou, was full of applause and shouting on Friday night. Ajoy Sahu, a designer from London, said being in a bar with so many others made him feel more “Olympicsy”. “I have been going back and forth between London and Guangzhou during the past few years. I feel like I am already a part of China,” he said. “The Beijing Olympics is a once-in-a-lifetime experience for me. I just want to watch the opening ceremony with the Chinese people,” he said. A huge screen was erected in front of the landmark Potala Palace in central Lhasa, the capital of the Tibet Autonomous Region, attracting hundreds of viewers who cheered and applauded. 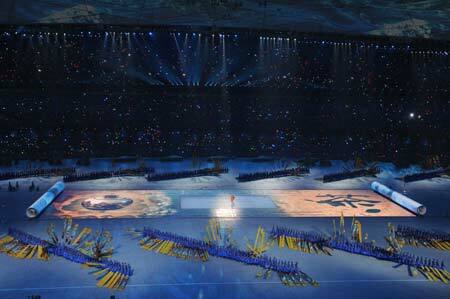 “The performance [at the opening ceremony] was just amazing. I could really feel the atmosphere [at the stadium] even though we are far from Beijing,” said local resident Soinam Cering. Famed Chinese mountaineer Nyima Cering was among the crowd. He said he was deeply impressed by the cauldron lighting at the finale of the ceremony. During the global relay of the Olympic torch, which ended in Beijing earlier on Friday, Cering and his team successfully took the torch onto the world’s highest peak, Mount Qomolangma (Everest), on May 8, for the first time in history. “I feel so honored to see the flame being lit at the Olympic Games’ main venue tonight. This is an honor belonging to all mountaineers,” he said. At Lhasa’s Jokhang Temple, one of the most sacred temples of Tibetan Buddhism, monks held a special prayer ceremony for the newly opened Games, according to monk Ngawang Qoizha. “We want to wish great success for the Olympics in our own way,” Qoizha said, adding that many young monks would watch the Games since they are sports enthusiasts. In Qingchuan County, Sichuan Province, hard-hit by the devastating May 12 earthquake, 70-year-old villager Qing Chang’an had spent 260 yuan (38 U.S. dollars) to buy a TV signal receiver just the previous day so that his family could watch the ceremony. “The Olympics is a grand event to be enjoyed by everyone across the country. We feel reassured about rebuilding our homes when we see the country is able to host the Games, even after the devastating quake,” he said. In quake-hit Xujiaping Village in Shaanxi Province, a 29-inch color TV, delivered by the provincial government, took center stage on Friday night. The villagers were thrilled to be able to watch the ceremony, even though 32 households out of the total of 35 had lost their homes in the quake. At a relocation center for quake survivors in Dujiangyan city, Sichuan Province, the keeper of a small grocery store, surnamed Wu, said she had sold a lot of beer and other beverages on Friday night. “People are celebrating the opening of the Olympics just as if it was a holiday,” she said. More than 40 high school students gathered in Beichuan, another area hard hit by the quake, for the ceremony. “The opening ceremony performances are wonderful, and they show the real China,” said Liu Guanghui, a senior student at Beichuan High School who made his way back to Beichuan to join his classmates for the show. “I sensed something from the opening — the real rise of China,” he said.